This is the best healthy hummus recipe! Learn the secret to making smooth and creamy hummus made with simple & healthy ingredients! Hummus has become one of those things that I ALWAYS have to have on hand in my kitchen. Seriously, if there’s no hummus in the fridge, then something just doesn’t feel quite right. I should probably warn you before making this recipe that this hummus will forever change your perspective on store-bought hummus. I’m serious here people, once you go homemade…it’s hard to go back. 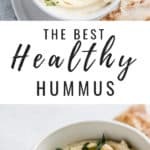 Since this hummus is made fresh with all natural ingredients, it won’t stay as long as store-bought hummus, which has never been a problem in my home since it usually gets eaten up within a day or two. 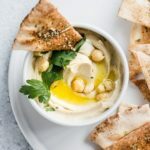 This hummus recipe is easy to make, naturally vegan and can be made in a Vitamix or food processor. 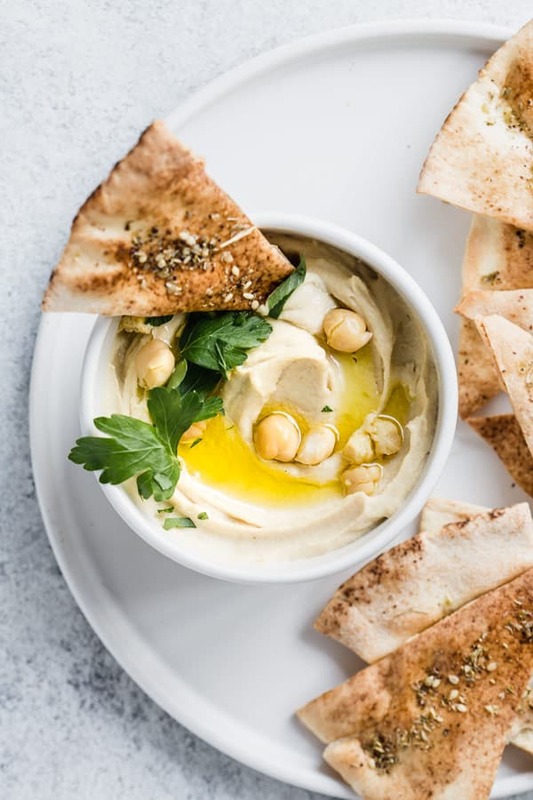 Let’s dive into how to to make the best healthy hummus, shall we? First off, you can use either dry or canned chickpeas. For this recipe to speed things up, we’re using canned chickpeas. If using dry chickpeas, soak them overnight and then cook them in a pot of boiling water until soft. Whichever type of chickpeas you chose to use, the next *crucial* step is to skin the chickpeas. Chickpeas naturally have a little peel on them, that will come right off when you gently squeeze them with your fingers, or when you roll them gently in a clean kitchen towel. Don’t skip this step! This is going to give the hummus that smooth and creamy texture. Next we’re going to cook the chickpeas in a pot of boiling water on medium-high heat for about 10 minutes, until they’re extra soft. This is step two in achieving creamy dreamy hummus. I’m serious, let’s not skip these steps! They’re 100% worth it. The next important part of making the best healthy hummus is using a good quality tahini. It should smooth and creamy and a bit runny. You can use either a high-speed blender (like a Vitamix) or a food processor to whip up your hummus. Both will work just fine! 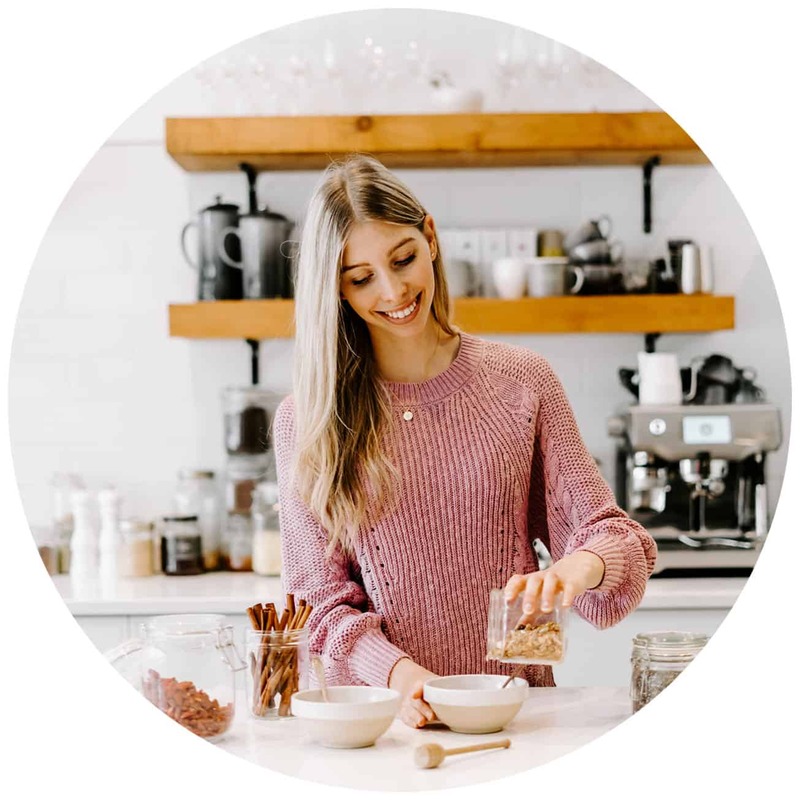 Whichever you use, make sure to blend and mix for a good 4-5 minutes to make sure everything is well incorporated. I like to make homemade pita chips to serve with the best healthy hummus. 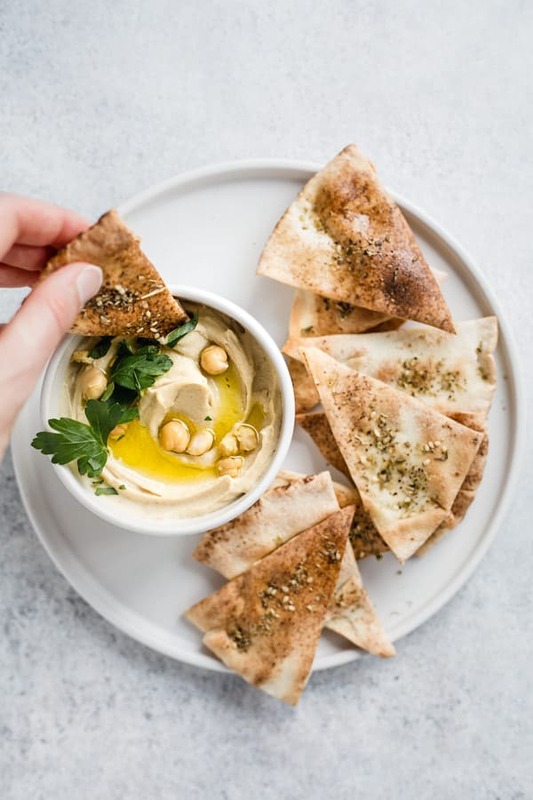 To do this I just cut up some pita into triangles, brush them with olive oil, sprinkle them with za’atar spice, and toast them up until they’re nice and crispy! 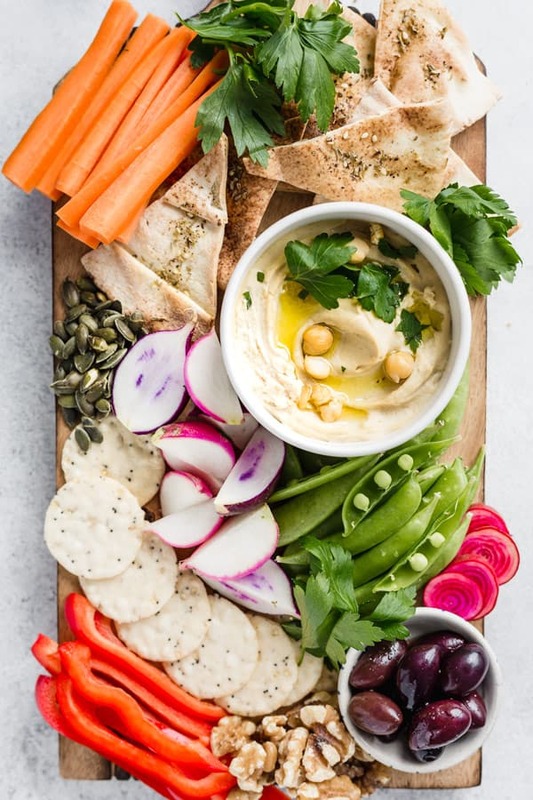 If you’re looking for some other great hummus variations make sure to check out this roasted beet hummus and this edamame hummus recipe! 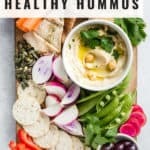 This is the BEST healthy hummus recipe! Find out the secret to making smooth creamy and fluffy hummus! 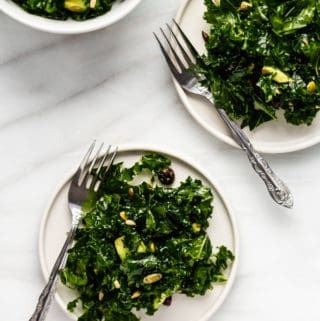 olive oil, za’atar, paprika, parsley or whatever you like to top! Drain and rinse the can of chickpeas and remove the skins by rolling the chickpeas in a clean kitchen towel. The skins will naturally come off. Discard the skins and place the chickpeas in a pot of boiling water with 1/2 tsp baking soda. Cook for 8-12 minutes on medium-high heat until the chickpeas are soft. Remove from heat and drain. Add the chickpeas, tahini, garlic, salt, cumin, olive oil and lemon juice to a food processor or high-speed blender. blend until everything is smooth, scraping down the edges as needed. Begin to add the cold water, adding 1/4 cup at a time and blending to incorporate, for about 5 minutes. 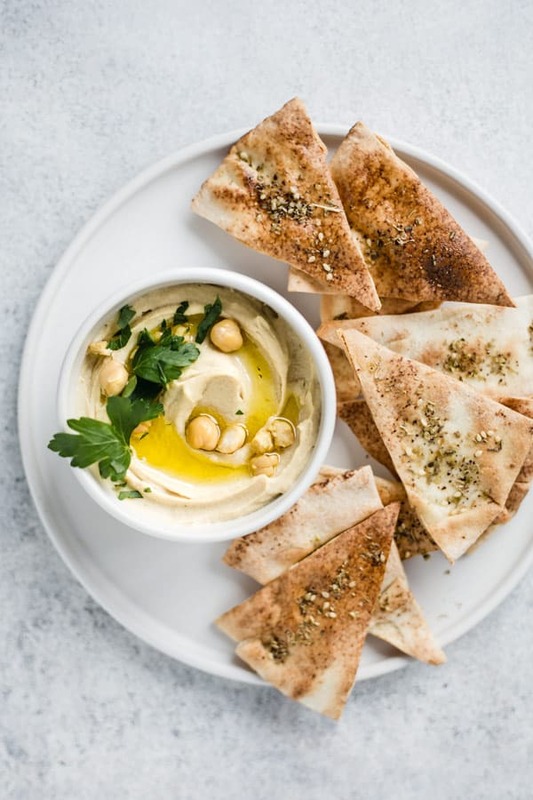 Serve the hummus with olive oil, za’atar spice, paprika, or parsley on top. I use about 1/2 tsp of salt but depending on the chickpeas you use you may want to add a bit more salt or seasoning. Taste and adjust accordingly. Oh my! This hummus looks so creamy and yummy!! Thanks so much Sheenam! Hummus is definitely one of my favourites to snack on! You’re SO RIGHT about removing the skins. I do it in a clean dishtowel. A little messy but so worth the effort. Absolutely silky smooth, no annoying little “bits” of skin. 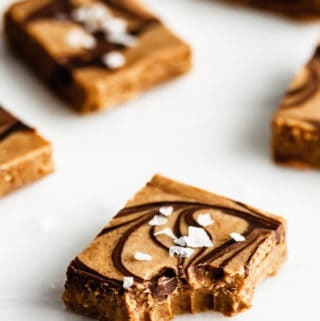 I read and re-read your recipe but could not find how you use the baking soda. I use it to help the skins come off of the chickpeas; it acts as a bit of an abrasive but does not screw up the taste. 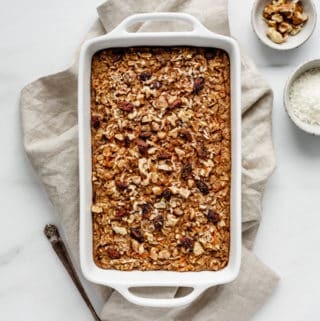 Hi Lizzie, so happy you loved the recipe! Removing the skins truly makes all the difference, right? The baking soda goes in the boiling water with the chickpeas. It’s not entirely necessary but helps soften them up a bit! Oh yummy! I‘m definitely going to make it. 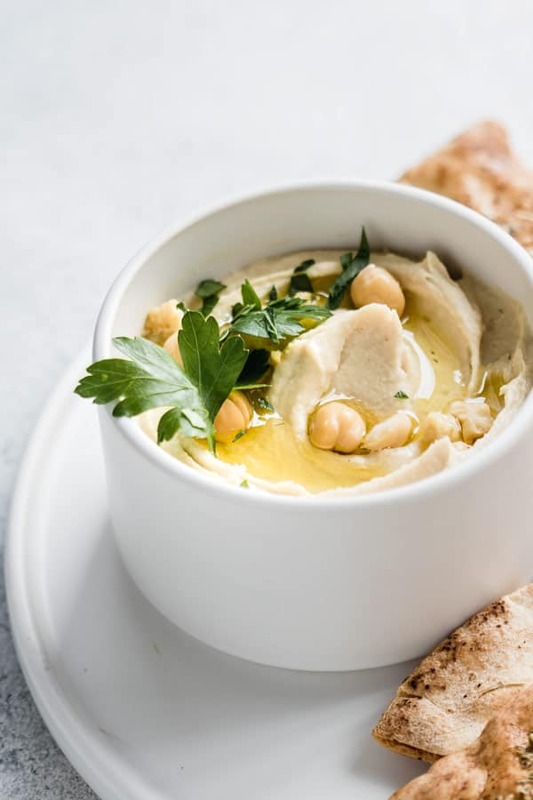 Love Hummus so much ? Thanks so much Bianca! Hummus is just the best! Thanks Sarah! Hummus in a daily must in my books!! I made this twice and it’s amazing! It took me a while to peel the chickpeas though. It helped a bit to roll them under running water in a strainer! Thanks Sara! And that’s such a great tip to do them under water. Definitely going to need to try that next time! !